Upon acceptance to the CEIN, MS, DNP and PhD programs, a $1000 non-refundable deposit toward your tuition will be required prior to course registration. Appointments available and can be reserved by emailing Victoria Connors. Information sessions for high school students who have not yet applied to UConn are every Wednesday and Friday at 11:00 a.m.
Information sessions for prospective Nursing Accelerated Second Degree Program - CEIN/BS students are every Wednesday at 10:00 a.m.
Information sessions for students looking to change major or transfer are every Friday at 10:00 a.m.
Also, check out Husky for a Day - a one-on-one opportunity with a current student! Information sessions for prospective freshmen are every Wednesday and Friday at 11 a.m.
Tuesday, April 9 11 a.m. - 1 p.m.
Tuesday, April 16 11 a.m. - 1 p.m.
Thursday, April 18 2 p.m. - 4 p.m.
Tuesday, April 23 11 a.m. - 1 p.m.
Open Hours for those seeking information for prospective students are every Wednesday and Friday from 11AM-12PM. Appointments are recommended. Please contact Victoria Connors. Information Sessions with the Admissions & Enrollment Office for prospective Accelerated Second-Degree CEIN/BS students are every Wednesday in Storrs at 10 a.m.
No sessions at this time. There is parking in front and in back of the building from 5pm on. If you come much earlier or there is no parking left (which may be the case), the closest parking area is the North Garage. You should give yourself 10-15 minutes to park and walk to Storrs Hall. Please note that it is approximately $1/hour to park in the North Garage. The Widmer Wing classroom is in the newer part of Storrs Hall. If you are entering through the new Widmer Wing, the classroom will be on your left as soon as you enter the doorways. If you are entering through the Storrs Hall portion, go in the entrance door and go through the door ahead. Go down the set of stairs and straight through the lobby – the Widmer Wing classroom will be on your right. Drive into the main entrance of the campus, bear right after the campus police station (it looks like a small castle) and public parking is there along the water. For Room 212, take the stairway to your left up to the second floor. Take a left and room 212 will be down the hallway on your right. For Room 302, take the stairway to your left up to the third floor. Take a right at the top of the stairs and room 302 will be on your left. 4. Take a left and follow the walkway/stairs or wheelchair ramp down to East Main Street. 5. Look across the street and to the left–you will see the entrance to UConn Waterbury! The campus is on Broad Street between Washington Boulevard and Franklin Street; officially 1 University Place, Stamford, CT. When using GPS, please use the address 1 University Place, Stamford, CT 06901. The nearest parking garages are the Target, and Bell Street, garages. Please click here for a map of these parking garages. 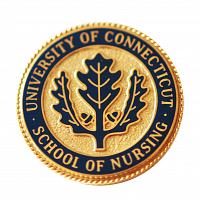 Join us as our Class of 2019 student nurses receive their nursing pins and prepare to join the clinical practice world.